We’ve been pretty good when it comes to health monitoring. We’ve had a basic electronic blood pressure monitor called ‘Sphygmo’ for several years now. We use him quite frequently to keep on top of things and to be able to detect any potential ‘hiccups’. He’s simple, reliable and easy to use. Our new one – the Braun ActivScan™ 9 Blood Pressure Monitor – is a different beast altogether. 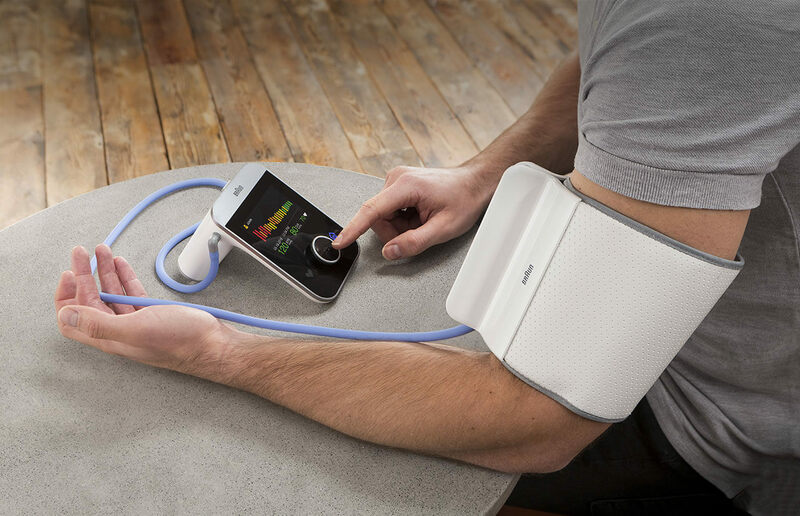 As well as having a very comfy and easy-to-use cuff, it also has the facility for tracking regular blood pressure readings for two different users. The display graphics are clear and bright and give a really good depiction of any trends. These help iron out the spikes that inevitably appear here and there. On the downside, I found the control panel a little bit cumbersome at first. Our old one was as simple as ‘put on cuff and press button’, whereas the Braun ActivScan™ 9 asks for quite a lot of setup information. I felt that it involved quite a lot of clicking around the first time I used it. Once the users are programmed in, however, it’s all much easier. There’s a touch-sensitive ‘Home’ button on the right of the display, and an instant pressure reading button on the left. Once the users are programmed, the unit asks which user to select on startup. This helps prevent and avoid any accidental readings on the history and graphs. It’s worth bearing in mind that the cuff is very sensitive to its positioning. A little too high or too low and it seems to get angry and tries squeezing all the life out of your arm before declaring ridiculously high readings. Re-positioning the cuff to exactly the position instructed gives much more consistent (and realistic) results. These all help with accurate health monitoring overall. All-in-all the Braun ActivScan™ 9 is a sturdy and well-built unit with an array of useful features, including a bluetooth link with your smartphone that downloads and keeps your readings to-hand. It has clear and easy to read instructions, and after the aforementioned setting up process, is quite straightforward to use. I can see the Braun ActivScan™ 9 displacing our ‘old faithful’ blood pressure monitor simply because of the tracking and graphing facilities it provides. It’s perhaps a little more ‘fussy’ in terms of positioning and setup than older units. But when you know what’s required it really is an excellent device. Time will reveal its long-term performance I suppose, but looking at the build quality I think we can look forward to many years of sterling service.